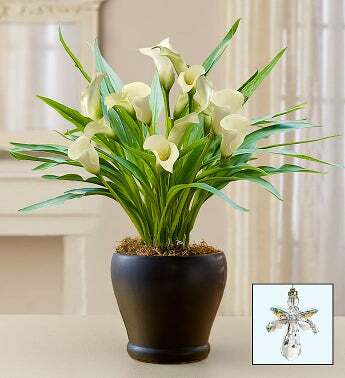 Send a timeless expression of your condolences with our striking white Calla lily plant. Available in small or large, the elegant, cup-shaped blooms pair with a classic black ceramic planter, creating a lasting tribute for a life so beautifully lived. Add to your sentiment with our keepsake crystal guardian angel ornament, which will help keep the memories of a loved one with them always.